A bitterly cold day has settled over London. The teeming bustle of St. Pancras Station lies nearby, but a hush falls over a small churchyard tucked in the streets behind it. The few remaining leaves overhead rustle dryly against the skeletal fingers of the trees that scrape the suffocatingly close, grey sky. In summer this unassuming, almost humdrum cemetery would be teeming with life, tourists huddled around one particular headstone – the one-time resting place of Mary Wollstonecraft Godwin, author of A Vindication of the Rights of Woman, as its inscription reads – but now there is something hauntingly barren about the place. Golden lamps glow behind the small windows of the church, an inviting warmth that seems to amplify the creeping cold outside that raises up from the hard frosted ground wrapped tightly around its silent inmates. This ground is steeped in layers of tales and haunting. It’s not just the stone reminders of those who were buried here – those whose graves have long since lain quiet, the footsteps of their loved ones dwindling with the march of time. It’s also the ghosts – the lingering presence of the living who once frequented these grounds, who gathered on the hallowed earth to commune with their lost loved ones, and to while away the hours in story and conversation, hovering at the limits between the living and the dead. The sodden grass dwindles into well-trodden mud around a rather plain, square-topped headstone in the middle of the cemetery. Lichen curls in mottled spatters across its worn sides, and moss piles thickly on top, its spongy tendrils soaking up the rain that periodically drifts through the spindly trees. It is the headstone of Mary Wollstonecraft Godwin, radical thinker, pioneering feminist, philosopher and writer, once deemed “a hyena in petticoats.” She was also the mother of Mary Shelley – author of Frankenstein – but the two would only get to experience 10 days together before Mary Wollstonecraft died of a postpartum infection, and the baby Mary Godwin was left to be raised, along with her half-sister Fanny, by her father William Godwin. Mary Wollstonecraft was buried in the churchyard where she had married William Godwin, and her grave, nestled between two weeping willows planted by her husband, played an incredibly formative part in the life of her daughter, who would draw on these early experiences with death and graves 19 years later when writing her novel. When Mary Shelley was a child – young Mary Godwin – she spent much of her time at her mother’s grave. She felt close to her mother here, and would let her imagination run wild under the sanction of her mother’s guiding spirit. When she felt sad or unloved, she would wander through the fields to be “with mamma” at her grave, and she wrestled keenly with the idea that her own birth was the cause of her mother’s death (a sense of monstrosity that has led some critics to interpret Frankenstein‘s monster as a representation of herself). Her own ghost lingers here too: the inscription in the stone has worn and softened over the years, recalling in its path the movements of the young Mary, tracing the carved letters with her tiny fingers. In moments that might sound morbid to modern readers, but which were touching for the bereaved father and daughter, Godwin taught Mary how to read and spell her name by tracing it upon her mother’s headstone. Her mother’s grave played a crucial role as Mary grew older too. In 1814, when Mary was just 16, the first sparks of attraction blossomed between her and the young poet Percy Bysshe Shelley, a recent visitor to her father. Shelley was already married, unhappily, but his mutual attraction with Mary became so strong that they began meeting in secret. The ideal location, removed from the prying eyes of the Godwin household, was Mary’s mother’s grave. The lovers began spending more and more time, stealing twilight walks through the cemetery, discussing many topics that would flare Percy’s admiration for Mary’s keen intelligence and creative mind. As Mary would later write to Shelley (after his own tragic death), “That church yard with it[s] sacred tomb was the spot where first love shone in your dear eyes.” This “sacred tomb” was the site where the pair first declared their love for each other, standing together on Sunday, June 26th, 1814, in “a calm twilight” under “the lamp like moon…hung out in heaven” with the “dye of sunset” still lingering in “the bright west.” Under the beauties of this sky, with the sense of her mother’s spirit hovering near, sanctioning the union (with her radical views on marriage and sexual relationships), Mary kissed the man she would later marry. They may have even made love in that very spot. A month later they would run away together, eloping on a wild adventure through Europe. Having served as the place where the young Mary would evoke a ghostly sense of her mother’s presence, where she would learn to trace her own name on the headstone, and where she would court her lover, once more evoking the powerful ghost of Wollstonecraft’s revolutionary spirit to sanction their union, Mary Wollstonecraft’s grave became the site at which death and the ghostly were woven into Mary’s life as familiar elements. Her novel Frankenstein would deal heavily with the idea of death and of life after death – of communion with departed loved ones, and of the sense of a life doomed to loss and destruction. The novel’s – and Mary Shelley’s – general preoccupation with death might be traced, in its earliest moments, to Mary’s experiences at her mother’s headstone. These moments have become ghosts in the landscape themselves. In 1836, William Godwin was buried next to Wollstonecraft, but after Mary Shelley’s death in 1851, both bodies were disinterred and moved to St. Peter’s churchyard in Bournemouth, where they were buried alongside their daughter. Now, the empty grave in St. Pancras is doubly marked by presence and absence – the haunting memory of the woman once buried there, and that of the daughter whose living moments were shrouded in the presence of death, and whose closest experience of her mother could best be felt at her grave. What do you think about the tale of Mary Shelley at her mother’s grave? Leave your thoughts in the comments below. Photos of Old St Pancras Church and Headstones taken by me on a visit to London in 2017. © Kirstin Mills. 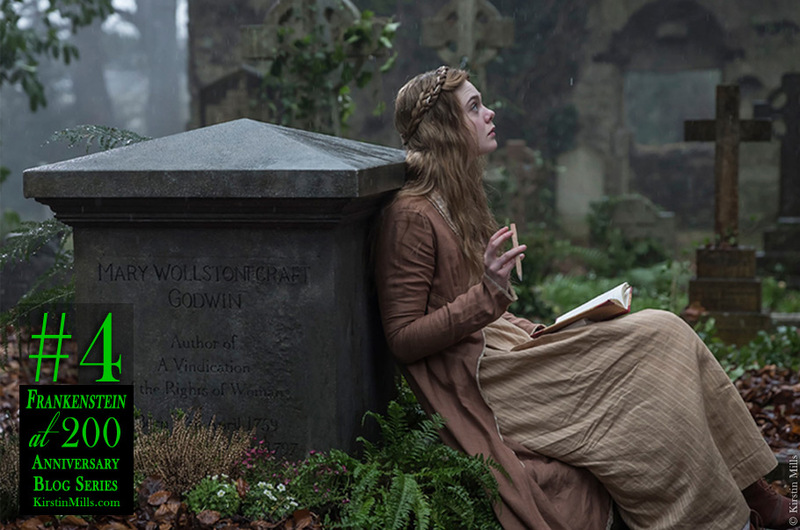 Title image: a still from the film Mary Shelley (2018) depicting Mary Shelley writing at her mother’s grave. Read more about Mary Shelley’s life in one of the many biographies available, such as Emily Sunstein, Mary Shelley: Romance and Reality. Baltimore: The Johns Hopkins University Press, 1991.